As the new year approaches, I feel that I am blessed in many ways: my wonderful children, a meaningful job as a nurse, our health! I wake up every morning to a new day, where I can do what I need to do without too many aches and pains. We have a roof over our heads in a clean, albeit small, home. However there is a lot of debt from a variety of things like schooling, old divorce costs from 10 years ago and medical bills that keep me from getting ahead. It is frustrating. I really can’t work too many more hours a week (a job as a trauma nurse is very exhausting, yet rewarding). I already work more than 40 hours every week. My time with my children is precious and can never be replaced. I would love, love a job where I can have more flexibility to work from home. 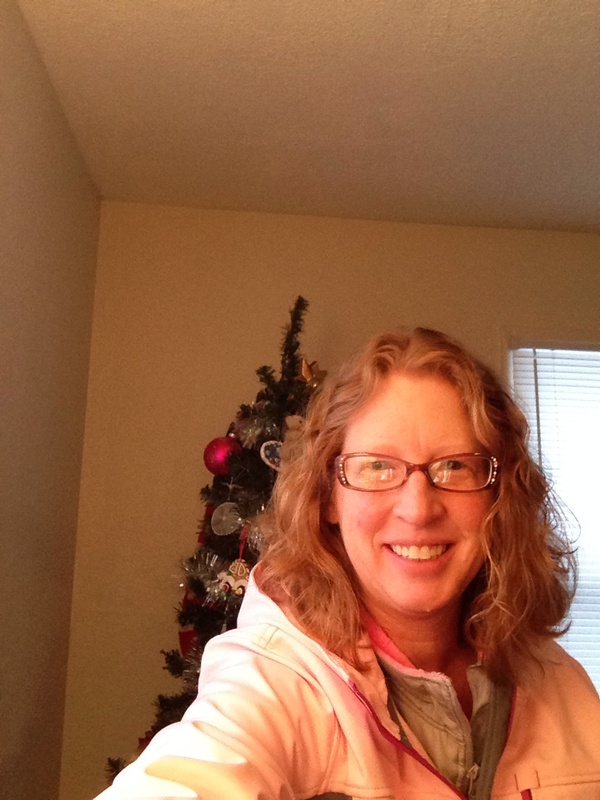 I worked very hard for my nursing job, and love that I can make a difference in people’s lives, but it is very hard to work around the long hours when you are a single mom. So I continue to plod along, trying to find a solution, praying that my body can hold out long enough to get ahead. 4) Put aside a separate fund for fun stuff, like travel!! 7) Work on my writing and blogging more. 8) Save for a better phone and or camera so I my daughter and I can make better quality You Tube videos, which is something we both enjoy. So what are your goals for the new year? I would love you to share in the comments section. Happy New Year! I hope everyone has had a wonderful holiday season. It is Christmas light season again and we were able to see a lot of beautiful displays. In the late 1800’s and the early 1900’s candles were used to illuminate trees, sometimes glued to the branches or secured with pins. Unfortunately, the candles on the drying tree proved to be a fire hazard. The first Christmas tree to be lit by an electric string of lights was in New York City in 1882. By 1890, electric strings of lights for trees were becoming widely available. We were amazed at the variety of lights we saw, from lights which played in tune to Frozen to blinking bridges. Happy Holidays a few days late! I love life’s small pleasures! Thanks for sharing! All those children, in the Army School, in Peshawar, Pakistan. They were killed indiscriminately and many, very cold-bloodedly. They were made to stand near the wall and just killed in front of all the others. This will always be a part of the lives of those who survived. Emotionally and physically scarred. Why such violence? What wrong had the children done? There are no sane answers but those who killed have their answers. I really don’t understand why such acts are called ‘inhuman’ because they are so human. Only humans, amongst all animals, kill for the joy of killing. All those parents would have sent their children to school that morning never dreaming they would not see them alive again. 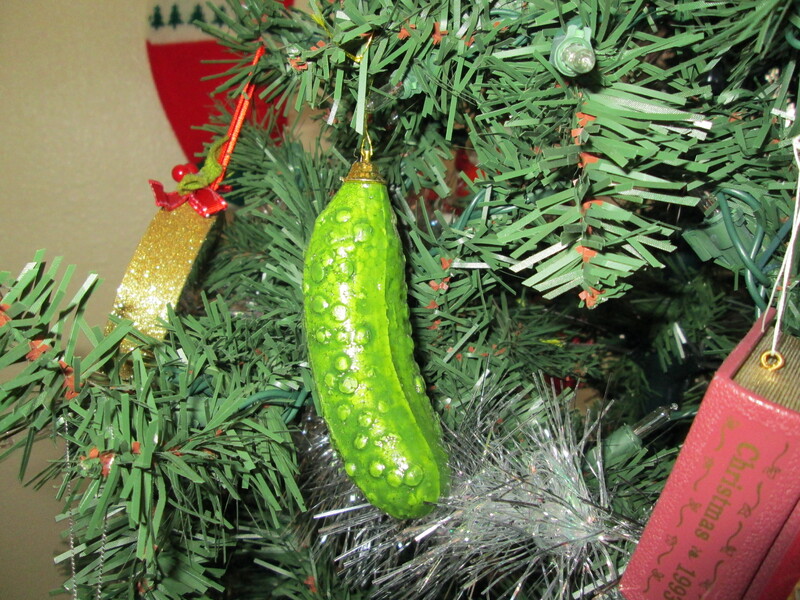 The tradition of hiding a pickle in your tree on Christmas evening is said to be based on an old German tradition in which the parents placed the pickle on the tree after the children went to bed. On Christmas morning the most observant child who found the pickle would get to open the first present. We have decided to continue that tradition this year with a pickle in our tree (okay, not a real pickle, but a plastic painted one instead). Although the version on our ornament box was the German version, there are several other noble beginnings to the “pickle in the tree” story. One version, which began in the middle ages, tells of two young boys who stopped at an inn, and the innkeeper put them into a pickle barrel. Fortunately for them, St. Nicolas stopped at the same inn. Realizing the boys were trapped in the barrel, he tapped the sides and the boys were freed. Another modern version comes from the American Civil War era, where a young prisoner of war begged a guard for food, and was given a pickle. The pickle gave him strength to survive. I am not sure if there is any truth to the stories, but the focus on good will to fellow mankind seems to be a common theme. 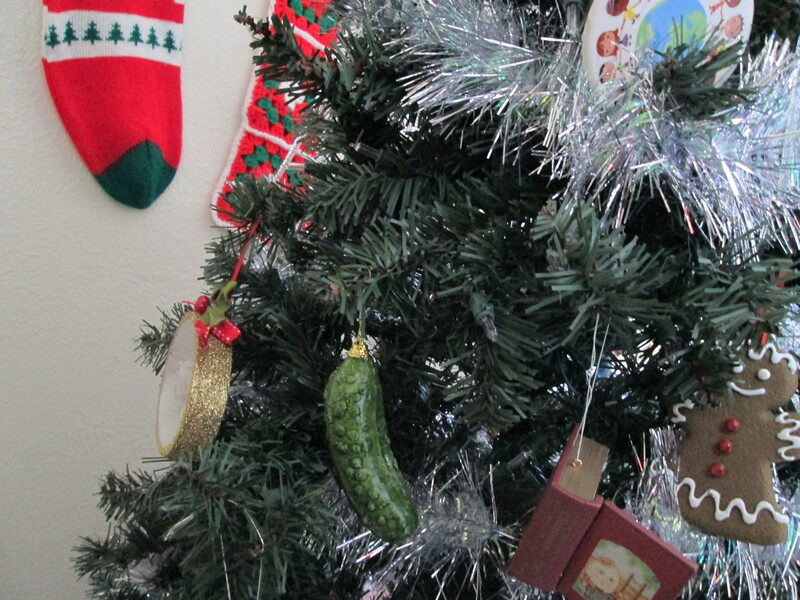 So, I will be hiding the very green pickle in the boughs this year. Lets see who finds it first! So there you are, the small pleasures of my week. I hope your week was wonderful and I am looking forward to next week. Bring it on! One of the things I have noticed as I age is that I worry less about what other people think. Today my kids and I enjoyed running through the leaves on the grounds of a local museum, dancing with elves and visiting with bassoon players. Just a few years ago, I would have quietly walked by the elves, but now I feel free to dance along if I feel the need or throw leaves at my kids! The bassoon players took the time to explain how the bassoon works and played several holiday songs. 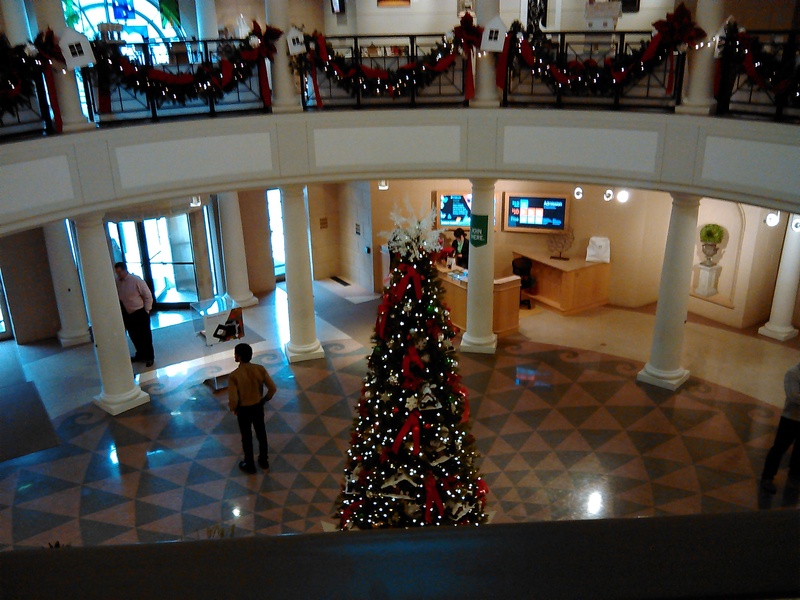 The occasion of all this frolic was the Festival of Trees at the Philbrook Museum in Tulsa. 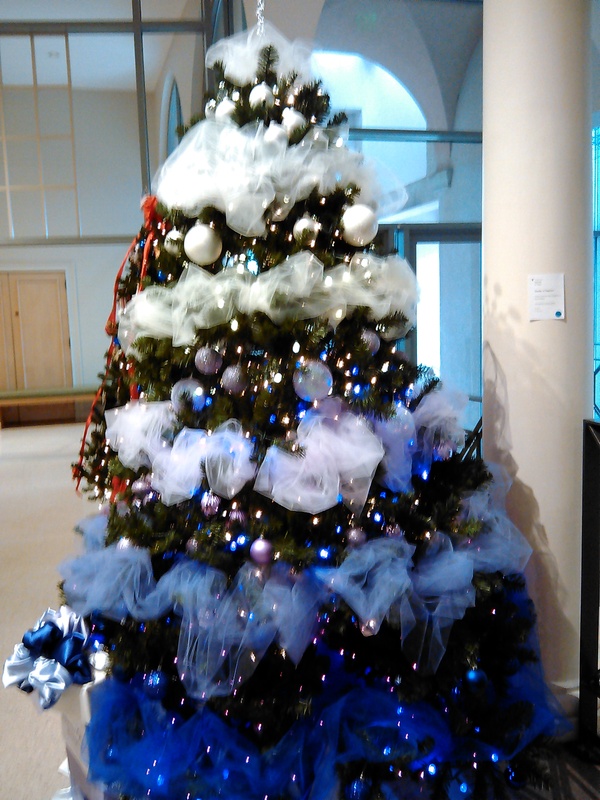 Every year donors create beautiful, unique Christmas trees and gingerbread houses, which are offered for sale. The proceeds go to the museum. What a amazing variety of creations there were. 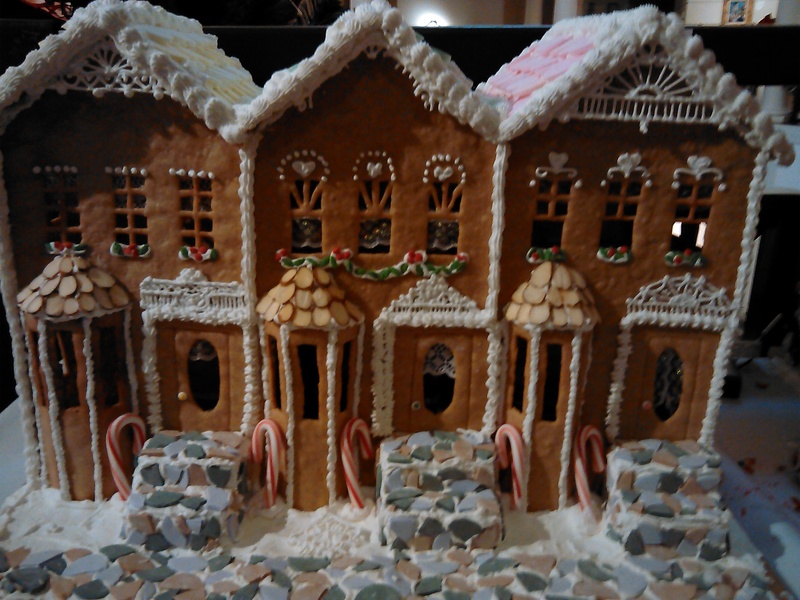 The gingerbread houses really caught our attention. 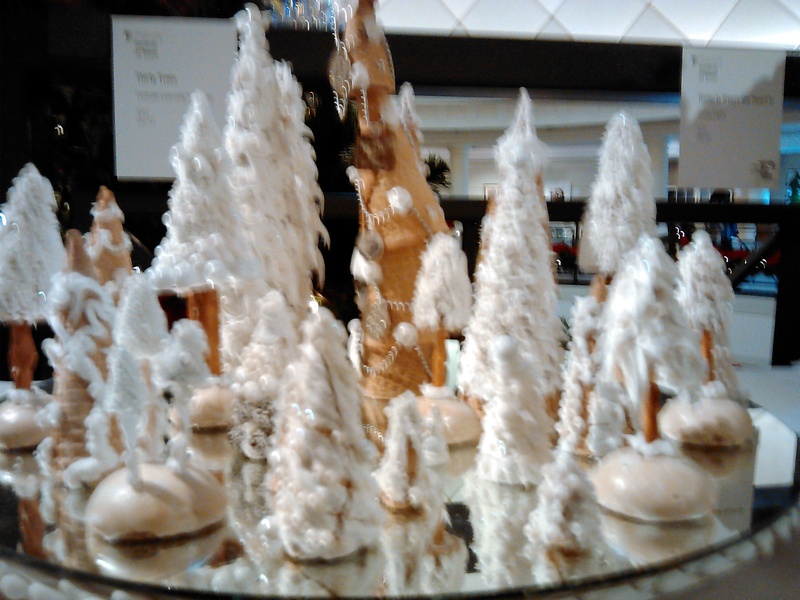 Besides the usual gingerbread house, there was a gingerbread garden, a church and a forest. Amazing. I have posted some pictures, but they do not do the creations justice. This holiday season, could you bring me an extra dose of patience and understanding? I know these things can’t fit in a box or be mailed, but I really could use an extra helping. When my patients are are stressing me to the limit, or I just don’t feel well after working four 12+ hour shifts, let me see the world through their eyes. Pray that I can show God’s love in what I do and say. Thank you for your time Mr. Claus. P.S. Your helper in the mall has a very realistic beard. Mercy is not often a word we hear in our everyday discussions. It seems to be an old-fashioned term that has been replaced by tolerance and politically correct expressions. Open the newspaper and there are no stories that encapsulate the meaning of mercy. Instead stories of intolerance abound in which one group insists that they are the ones representing sanity. For me the word mercy is closely intertwined with the word forgiveness. If one shows mercy, one is often able to forgive the shortcomings of others and their surroundings – including their religious and cultural beliefs. The merciful heart is already open to humanity and is not as judgemental as those hearts that are hardened and show no mercy. The merciful heart is also open to love – love for one’s fellow human being whether the person is a family member, friend or a stranger. My oldest daughter just got back from Italy and just loved it. I hope that I get to travel there soon! It is on my very long bucket list.